The list of favorite food in my family is quite long. It extends from simple humble alu sedho (mashed potato) bhat (rice) to mutton biryani. Every now and then I get requests to prepare something special for lunch or dinner. The requests mostly come from the little one in my house. I respect my daughter's food preferences and try to introduce her with variety of food. Thankfully she loves to try new food. And whenever I cook up something new or different from the usual she gladly accepts to play the part of the food critic. I find it amusing the way she tastes the first bite from her plate or licks the gravy or chew few little grains of rice. I think she is profoundly influenced by all the judges of cookery shows on TV, specially Masterchef. Fortunately she is a very lenient judge, most of the time I pass with flying colors with a request to make that particular dish again for her. She is the most important reason that motivates me to create something new in my kitchen. So on a note to impress her while preparing some meatballs to go with the pasta, I thought to give it an Asian twist. 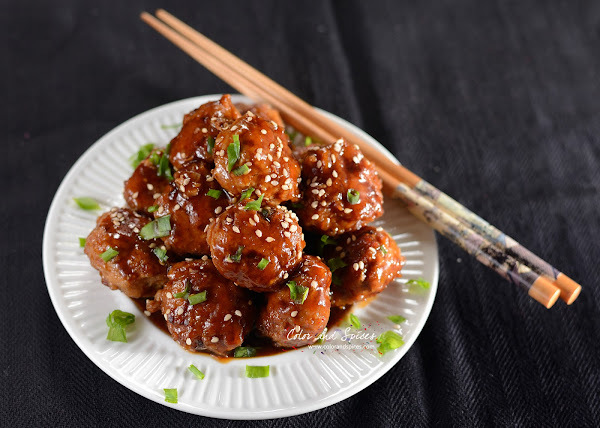 Instead of basil, cheese etc I used soy sauce, ginger, garlic to flavor the meatballs and it came out so good and replaced pasta with fried rice. I shallow fried the meatballs. 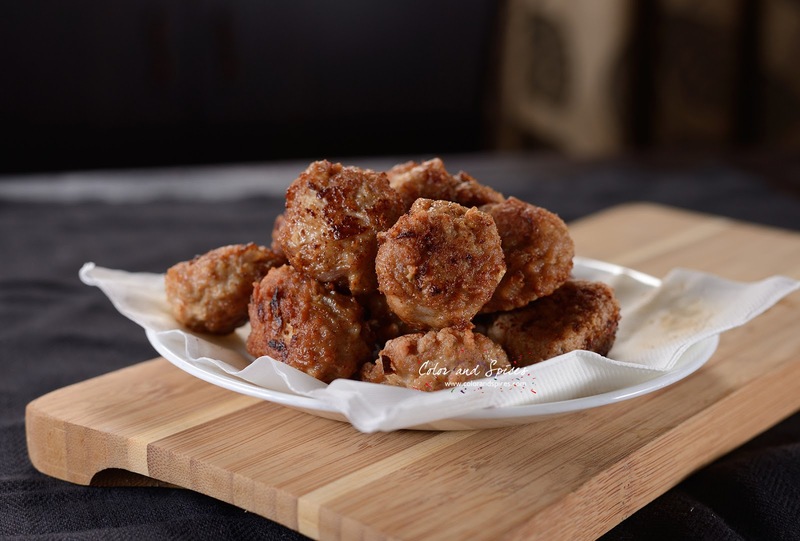 The meatballs can be baked in oven or deep fried, as per choice. 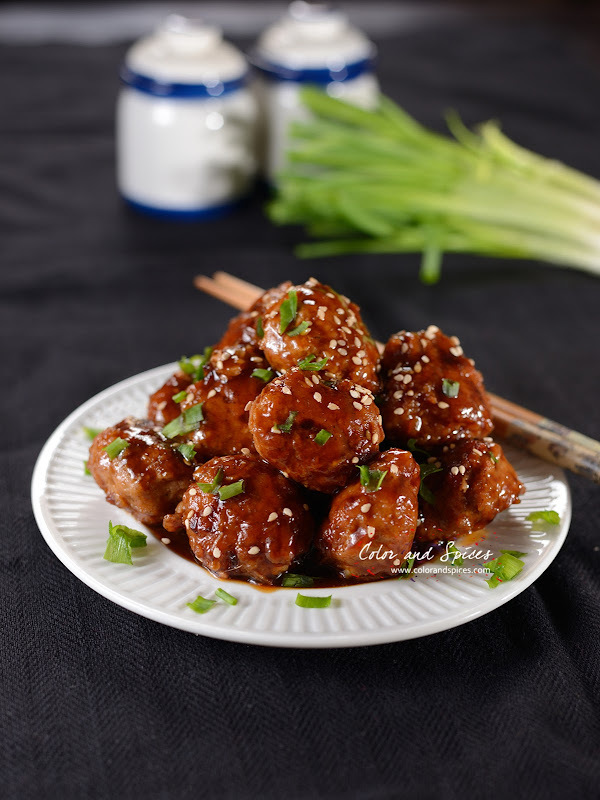 I glazed the meatballs with sweet and spicy combination of sriracha, honey and soy sauce. The result was finger licking good. 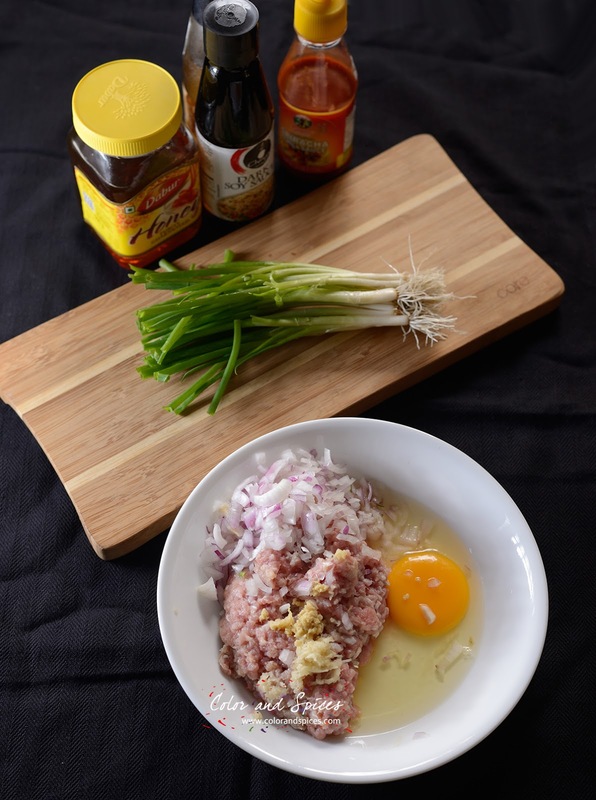 The ingredients for this recipe are easily available. 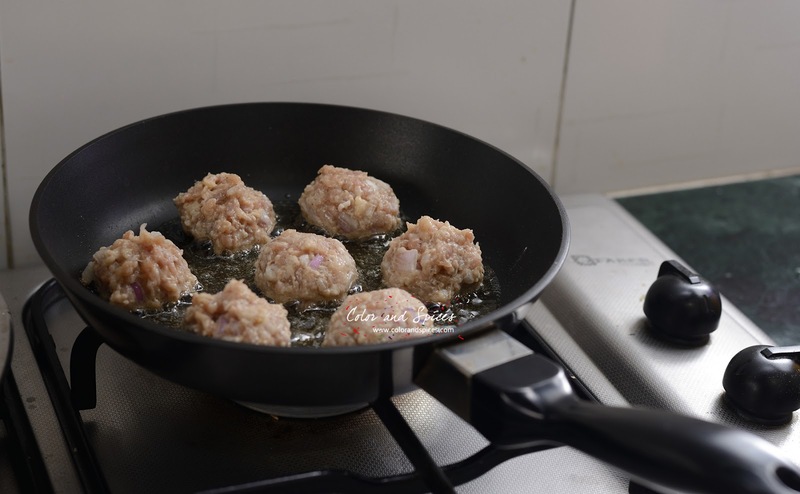 I used minced chicken to make the meatballs, you can use any other meat of your choice. Depending on one's taste the amount of red chili sauce and honey can be altered. If you like the meatballs to be very spicy add chopped green chilies or red chili flakes to it. 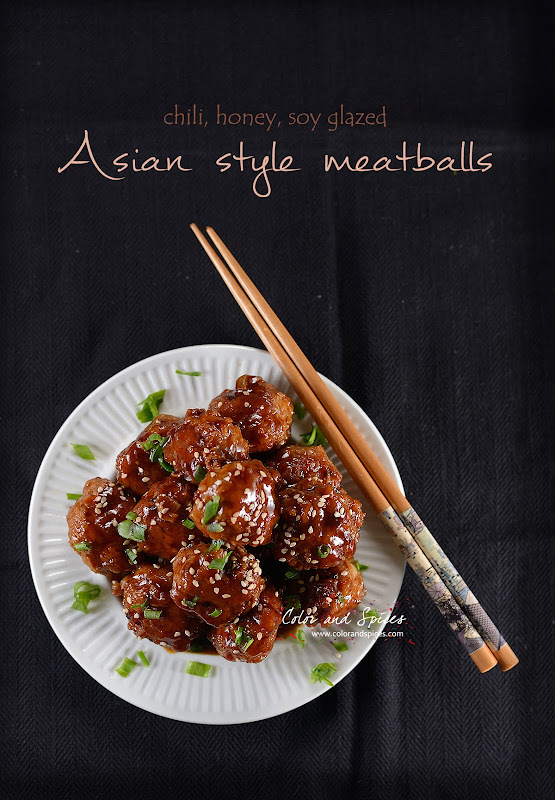 These delicious meatballs can be served either as a starter or a side dish. 1. In a bowl take all the ingredients for meatballs, mix well and make 14 equal size balls. 2. Heat 3 tbsp oil in a pan, when the oil is hot shallow fry the meatballs till nicely brown from all sides. Take out the meatballs and keep aside. 3. Mix all the ingredients for the glaze in a cup. Taste and adjust salt, honey and chili sauce accordingly. 4. Wipe off excess oil from the pan. Add 1 teaspoon of oil in the pan, when the oil is hot pour the glaze mix and let it boil. As it starts to boil add the meatballs, cook over medium heat and keep coating the meatballs with the glaze. 5. Transfer into a serving plate or bowl, garnish with sesame seeds and chopped green part of the spring onion. Serve hot. Pour the excess glaze in a small bowl and serve it as dipping sauce.